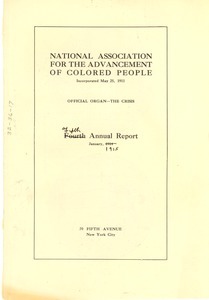 Search results: name:"National Association for the Advancement of Colored People"
10085 results found for: name:"National Association for the Advancement of Colored People"
New York (N.Y.) - Summary of costs and expenditures from January 1, 1916 through December 30, 1916 for the NAACP Anti-Lynching Fund. 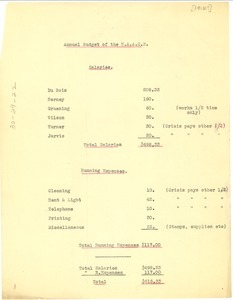 New York (N.Y.) - List of salaries and running expenses. 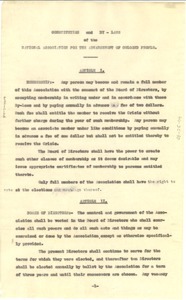 Unknown - Constitution and By-Laws of the NAACP with Du Bois's adopted revision with a slight change. New York (N.Y.) - Draft of N.A.A.C.P. 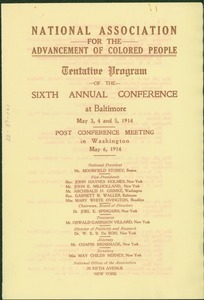 annual report for 1915. 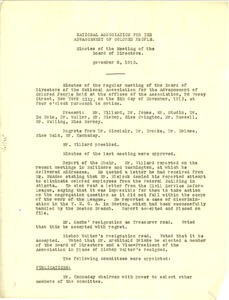 Drafted on copy of 1914 annual report. 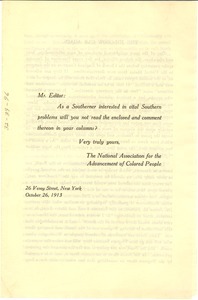 New York (N.Y.) - Leaflet, originally printed in the New York Post on October 3, 1913, discussing Jim Crow laws reprinted and sent to Southern newspaper columnists in an effort to provoke columns. 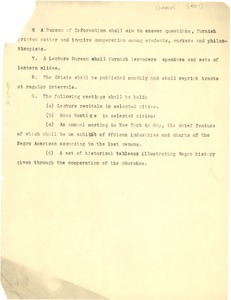 New York (N.Y.) - Page 2 of 2 page list of organizational structure of the NAACP. 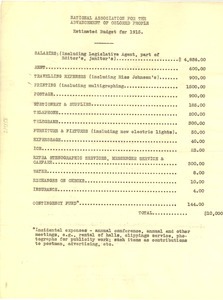 Includes lecture bureau, publication of the Crisis, and a bureau of information. New York (N.Y.) - Regarding ongoing activities of the organization including: segregation of federal employees in Washington D.C., establishment of committees, mass meetings, establishment of new fund, and establishment of new branches. 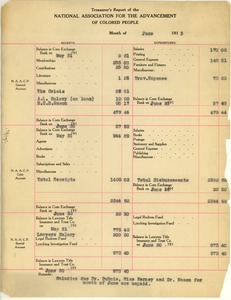 New York (N.Y.) - Financial accounts of the General, Crisis, and Special accounts as of June 30, 1913. 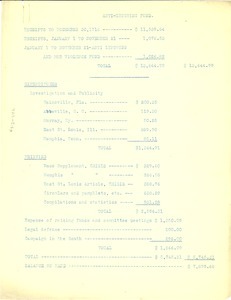 New York (N.Y.) - List of estimated expenses for 1915 budget of the NAACP.